A Global Water is an infinitely spread mesh with auto-tessellation that represents a boundless ocean (the wireframe of the water is not scaled; regardless of the camera position it always stays the same). It is optimized so the GPU is not overloaded. The object has support for the underwater mode. However, it cannot have a body assigned, and thus does not provide proper physical interaction with scene objects. Also it is limited to a single water level. It means that the filling level of water always remains the same. 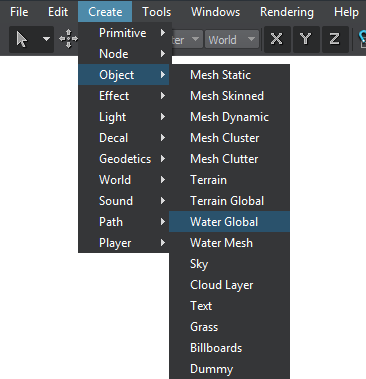 So, if you need to create, for example, mountain lakes or water flows with height difference, you should use a Water Mesh. As the water object uses the screenspace projected grid for the water surface of the infinite size, it is recommended to use only one (1) water object in the scene. Physical interaction of a water and other scene objects can be done by using a physical water object: you can place a physical water object in the water to indicate an area where physical interactions will take place. Infinite water will be added to the scene and you will be able to edit it via the Parameters window. 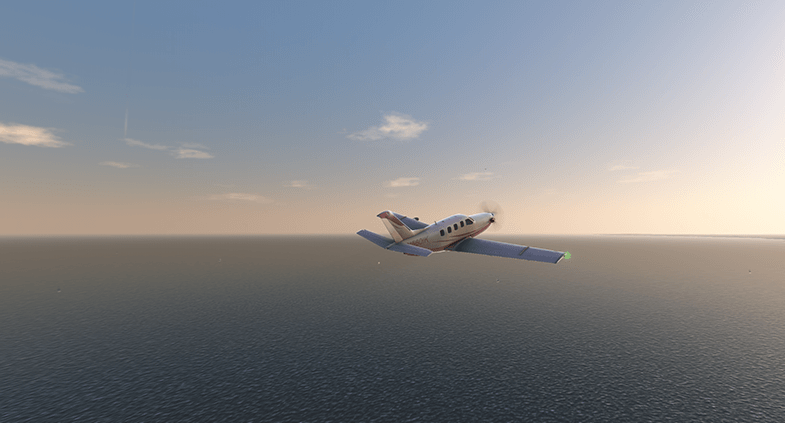 On the Node tab, water surfaces that determine optical and dynamic behaviour of water can be adjusted.